What is a table top sign? Signholders for tabletop use could mean a wide variety of things. A sign is often placed on a table top where patrons would see it, in order to promote products or services your company or business is looking to offer. By placing signage in prominent areas, your customers are more likely to notice these placards and either inquire about or simply purchase your products. This table top sign selection is ideal for use in a variety of business locations, as each model is universal in design. Retail stores, restaurant & food service locations (i.e. delis and bakeries), as well as supermarkets all make use of these tabletop signage holders. 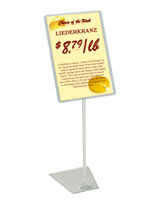 There are many different table top sign holders to choose from in this category. Some of the table top sign holders come with a plastic cardholder. This area is designed to hold signage measuring up to 2/5" in thickness. 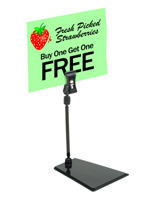 These particular tabletop stands also come with two pivot points: one connecting the table top sign clip to the upright pole, and one connecting the upright to the base. These countertop displays also come with a "shovel" style base. This particular base is designed for the placement under items on your counter. Where are these table top sign holders often seen? Retail Stores – a store location often places a table top sign clip for price tags on point-of-purchase and checkout areas to point out on-sale merchandise or an upcoming, in-store event. In these locations, customers are more likely to notice your displayed signage, and be lured into purchasing the items you are highlighting. Restaurant & Food Service Locations – This type of institution utilizes table top sign holders to display menu and drink specials on a bar. A restaurant might also place these signholders on individual tabletops to promote new menu additions. Salons & Spas – These table top clip holders often display pricing for hair products or other items customers can purchase after receiving salon services. 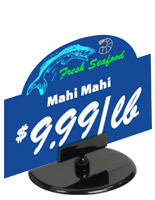 Supermarkets – Delis, bakeries and even seafood departments within a grocery store often place a table top sign clips for price tags amongst their food items for sale. The shovel-style base sits under trays of food, ensuring your signage will stay in place. Art Galleries & Museums – In these locations, the tabletop signholders often display names of artists and information about the piece of artwork, such as the period in which it was completed. Deli tags with clips are also sold in this category. These price holders are ideal for use in locations with signs of various thicknesses. Some of the units come with an axe style clamp, which opens to hold signage measuring 3/8" in thickness. Other sign clips for price tags offered here come with a clamp-style holder, which is much longer, and open to hold 1" thick signs. These clamps give users the most freedom, allowing a variety of placard types to be displayed with ease. What separates these signholder clips from others on the market? This site offers a wide variety of styles to choose from, for customers to shop just one online catalog, versus having to hunt all over the web for the style they are looking for. Many of the offered units are stocked to offer some of the shortest shipping lead times found everywhere on the web. The majority of the counter-top styles in this category are sold in both a clear or black finish, to blend in with the particular setting they are placed in. This site also sells a wide variety of other marketing displays and supplies to offer one-stop shopping to virtually every industry. Tabletop clip holders for price tags are just one of the many product lines this site has to offer. Displays2go is a trusted source for restaurant displays and food service supplies. This company has been in business since 1974. The offering of fixtures on this site continues to grow each year, in an effort to offer restaurant and food service establishments the supplies they need to have a successful business. Menu holders for tabletop use, bakery cases, bar supplies and even condiment racks can all be found in this online catalog. Signs for use on tables are ideal for advertising new menu additions. Tabletop signage and price tag holders can also be used to promote a "theme" night, such as karaoke night. A restaurant could also use the signholders to advertise for a local charity. This notifies patrons that a portion of the day's sales will go to a particular fund. This website is home to over 7,000 unique marketing display solutions, in addition to restaurant supplies. This site has it all, from trade show fixtures to tabletop retail showcases. Many of the offered goods are stocked in three large warehouses, in an effort to provide customers with some of the shortest shipping lead times found everywhere on the web. Items ship fast to save customers both time and money.